Mughlai Saffron Chicken Chaap Recipe – Whole Chicken leg pieces cooked in a rich cashew and poppy seeds paste.This Famous Bengali chicken recipe is a house favourite. The flavours are Mughlai and pure.Each and every ingredient sings its own song but it comes together in such a beautiful harmony! The only downside is the look of the chicken.Yes I have said it.I don’t like white looking chicken dishes because to me they seem bland. Having said that, this dish is anything BUT bland.The soaked almonds and Khas Khas puree gives the gravy gorgeous richness which along with the some choice spices makes this chicken dish an absolute delight! This Chicken Recipe is inspired from the book “Tiffin” by Sonal Ved.I got it as a secret Santa gift last Christmas and I would recommend this book to everyone.It’s sort of a know it all book for Indian Cuisine.I love just flipping through the pages of inspiration. This dish literally screams RICH ! Though it doesn’t call for any cream or dairy and no frying. It’s the blend of flavours and textures which make this dish an absolute standout chicken recipe. Step 1: Making the Cashew Poppy Seed Paste. Cook the onions to a golden brown hue.This along with he saffron will give a nice color to the dish. Wring the marinade out of the chicken and add to the hot pan.This is done to caramelise the chicken.After this step, add the marinade and the poppy seed paste. To make this dish healthier – you can use chicken breast instead of legs. To make the gravy less calorie dense you can dilute the it with water. My husband is forever a Chawal person(a perpetual rice eater) so he usually eats this with a khichadi or a pulav.Plus papad when I am feeling generous. I eat this with flatbreads- whole wheat rotis or parathas or Ragi roti. Mughlai Chicken Chaap Recipe – Whole Chicken leg pieces cooked in a rich cashew and poppy seeds paste.This Famous Bengali chicken recipe is a house favourite. Whisk together the ingredients listed under marinade in a large bowl.Add the Chicken and coat well.Marinate for at least 15 minutes to 24 hours in refrigerator. Soak the cashews and poppy seeds in 1 cup of hot water for 15-20 minutes. Drain the water and Grind it into a paste along with the 1/2 cup of roughly chopped onion and one green Chilli. Heat the oil in a pot.Once hot add the whole spices- cardamom, cinnamon, cloves and bayleaf. Add the sliced onions and cook them to a golden brown. Add the marinade, the poppy seed paste.Cook covered for 15 minutes. Give the chicken a mix, sprinkle the saffron strands on top and cook covered for another 10 minutes. Garnish with Kasoori methi and serve hot*. *If needed reduce the gravy at this point by cooking uncovered. 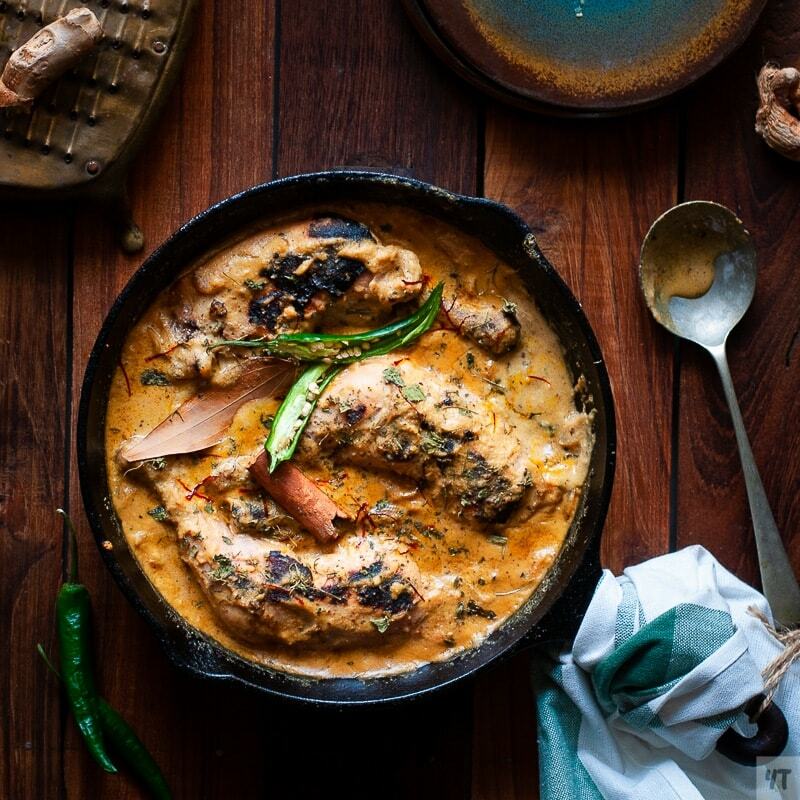 Here are some more amazing Indian Chicken recipes for you!